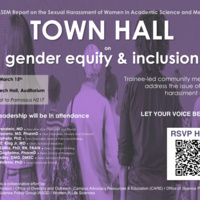 In 2018, the National Academies of Science, Engineering and Medicine (NASEM) released their report on the sexual harassment of women in academic science and medicine. It detailed that at least 50 percent of women experience unwanted sexual harassment in academia. This is your chance to let your voice be heard! We will be discussing how we can implement the report's recommendation on changing the culture of sexual harassment at UCSF. This is completely trainee led, and UCSF leadership will be in attendance! This is your opportunity to contribute to changing the climate at UCSF toward a safer and healthier space for everyone. There will be a simulcast to Parnassus N217 if you cannot attend in person. Otherwise, we hope to see you at Genentech Hall, Auditorium on March 15th at 1pm! Please RSVP via our Eventbrite invitation here.